SALEM—Before McNary senior Grant Biondi’s final high school meet at the Kroc Center, head coach Casey Lewin asked him to pick two events he didn’t normally swim. Biondi chose the 200-yard individual medley and 100 butterfly. That decision paid off as Biondi won the 200 IM in 2:24.75 and 100 fly in 1:06.70 on Tuesday, Jan. 30 against North Salem. Biondi, who hadn’t swam the 200 IM since he was a sophomore, set a personal record in the event by nearly five seconds. “It was kind of emotional because this is my last meet,” Biondi said. Biondi was also motivated to make sure he had a spot on the Celtics district relay teams. Vaughn, Rhoades, Sherwood and Brock Wyer took first in the 200 medley relay in 2:01.53. McNary’s boys easily defeated North Salem as a team, 129-32. Hooper won the 100 free in 53.36 and the 100 breaststroke in 1:09.31. Vaughn took first in the 100 backstroke in 1:09.91. Wyer had the fastest time in the 200 free, finishing in 2:22. Rhoades won the 50 free in 25.99. O’Connor touched the wall first in the 500 free in 6:28.14. 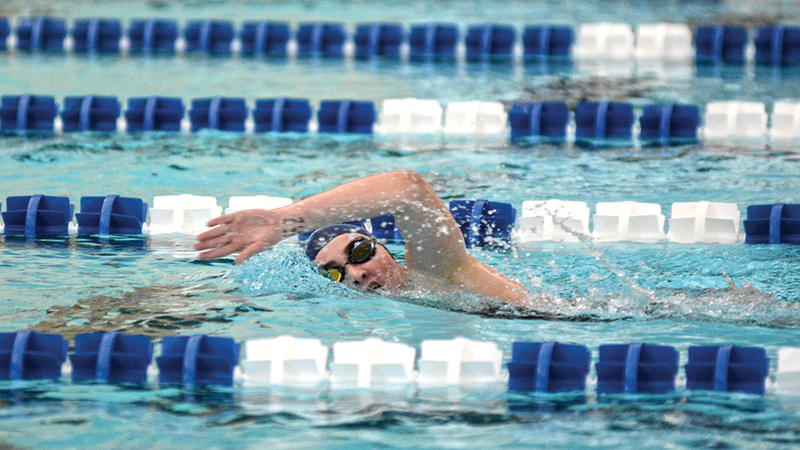 Biondi wasn’t the only McNary swimmer to compete in different events. Hannah Corpe swam the girls 500 free for the first time, easily winning the event in 6:28.18. The Lady Celts outscored North Salem as a team, 104-63. McNary won two relays as Alex Beard, Bella Beard, Emily Alger and Haley Debban opened the meet by winning in the 200 medley relay in 2:05.33. Alex, Bella, Debban and Alyssa Garvey then won the 200 free relay in 1:51.03. Alger had the fastest time in the 100 fly, finishing in 1:18.29, a seven second PR. Bella won the 200 IM in 2:31.88 and Alex touched the wall first in the 100 backstroke in 1:09.84. Madyson Trammel won the 100 breaststroke in 1:25.88. McNary will compete in the Greater Valley Conference district meet on Feb. 9-10 at the McMinnville Aquatic Center.